Pioneers in the industry, we offer mild steel c ring from India. Our company is one of the noted manufacturers and exporters of Mild Steel C Ring. C Rings are widely used in various processes such as bookbinding, Jewellery designs, machine assembly and others. 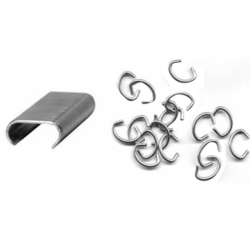 Our C Ring is fabricated from the superior grade materials of construction that are supplied by the noted vendors. C Rings are designed by our expert craftsmen and engineers using latest machine processes. Our C Rings and discs are widely appreciated for the properties like light weight, superior construction, and corrosion resistant finish. Looking for Mild Steel C Ring ?